0.2 m of textual records. - 3 photographs. Leeman Mackey (baptized with family name of Mackay) was born on 3 October 1883 to William Mackay and Jemima Rice in Weedon, Quebec. By 1911, Leeman had moved to Marbleton and appears to have been an apprentice under Alvin Barter, a butcher. Leeman Mackey was butcher in Marbleton. He took over Alvin Barter’s butcher business around 1916 and was the first butcher to go from village to village with a cart. Leeman married Dora Mackay in 1912 and together they had one child, Lloyd Allen, born in 1913. They also had a daughter, Una, who died in 1920. He died on 27 September 1966 and is buried at the Lakeside Cemetery in Bishopton. The fonds contains information on the butcher shop owned by Leeman Mackey and also on the Mackey family. It consists of several account books (1879-1938), a calendar (1926), a schoolbook (1908), a piano method (1969) and a few photographs (1909 & 1969). The photographs show T.S. Chapman in front of "Good Cheer Lodge" in 1909 and Kathleen Mackey with classmates at the Bishopton Intermediate School in 1969 (the last class before the closure of the school). The school book is autographed "Cora Brown". Among the account books are one for the Megantic Rifle Association (1879-1902), one that appears to be for a boarding house (1889-1892), and the others are from Leeman Mackey's butcher business. Some documents exhibit mold damage. The documents were donated in 1999. A classification plan is available. 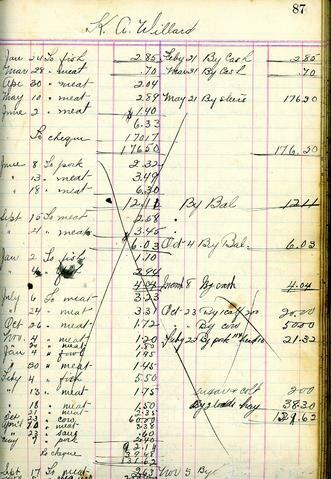 Digital object shows a page from Leeman Mackey's account register for K.A. Willard from about 1919.